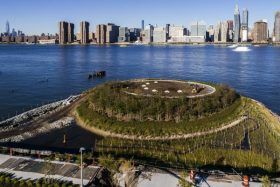 Long Island City is getting five more glorious acres of waterfront park space, with the city expected to complete Hunters Point South Park in the coming months. The second phase of the park, which stretches below 54th Avenue and wraps around Newtown Creek, is nearing completion after three years under construction, according to LIC Post. The city’s Economic Development Corporation says the opening date will come by late spring or early summer, so New Yorkers will have a whole new outdoor amenity to enjoy when the weather warms up.